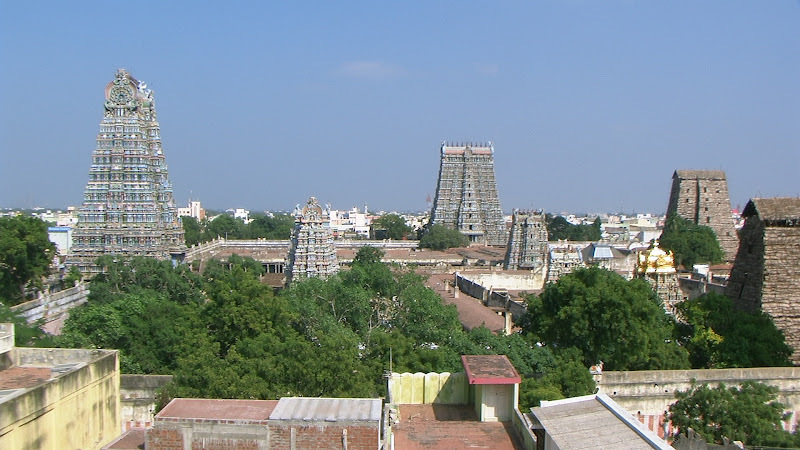 Temple covering an area of 17 acres, the entire Madurai city being built around it. Present structure is believed to have been built in 1600 AD. The tallest temple tower is 51.9 metres (170 ft) high. Madurai was the seat of the Tamil Sangam (or Academy) of learning. Concentric rectangular streets surround the temple, symbolizing the structure of the cosmos. Temple attracts six thousand visitors a day and gets an annual revenue of rupees 6crores. Attained 26th place in the list of top nominees for the new 7Wonders of the World. Madurai , is the oldest continuously inhabited city in the Indian peninsula. 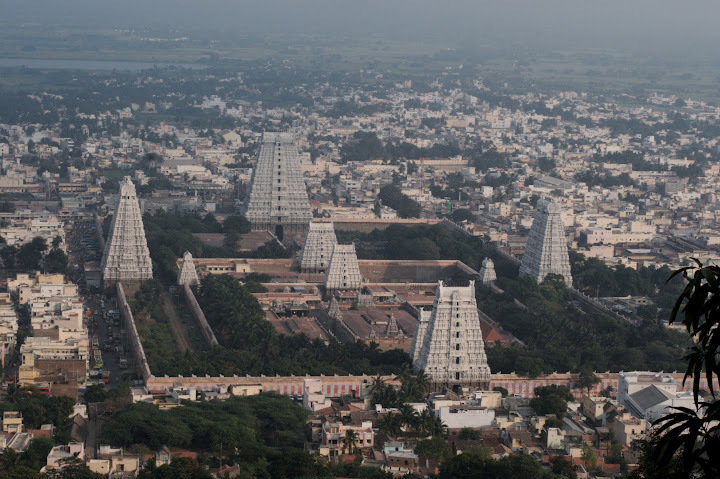 Madurai is also known as �City Of Divine Nectar�-Madhurapuri, cultural capital of TN. Madurai was once called forest KADAMBAVANAM. Once a merchant named Dhananjaya who was passing through the forest, saw INDRA - the king of Gods, worshipping a SWAYAMBHULINGAM under a kadamba tree in the forest. This was reported immediately to the king Kulashekara Pandyan. Kulashekara cleared the forest and built a magnificent Sri Meenakshi Sundareswarar temple around the sacred LINGAM and he built a lotus shaped city around the temple. On the naming ceremony of the city, Lord Shiva appeared magnificently to bless the city. The divine nectar (madhu) from the matted locks of Shiva fell on the blessed city. So, then the city was named "Madhurapuri". 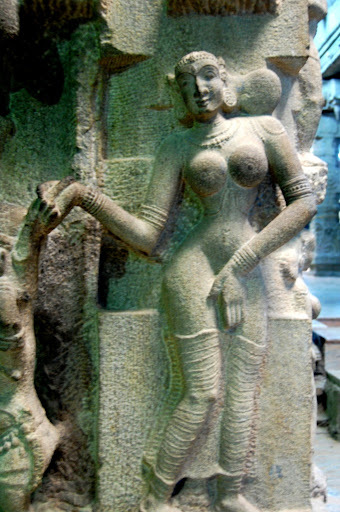 The Cholas ruled Madurai from 920 AD till the beginning of the 13th century. In 1223 AD Pandyas regained their kingdom and once again become prosperous. Pandian Kings patronised Tamil language in a great way. During their period, many master-pieces were created. "Silapathikaram", the great epic in Tamil was written based on the story of Kannagi who burnt Madurai as a result of the injustice caused to her husband Kovalan. In April 1311, Malik Kafur, the general of Alauddin Khilji who was then the ruler of Delhi, reached Madurai and raided and robbed the city for precious stones, jewels, and other rare treasures. This led to the subsequent raids by other Muslim Sultans. In 1323, the Pandya kingdom including Madurai became a province of the Delhi empire, under the Tughlaks. The 1371, the Vijayanagar dynasty of Hampi captured Madurai and it became part of the Vijayanagar empire. Kings of this dynasty were in habit of leaving the captured land to governors called Nayaks. This was done for the efficient management of their empire. The Nayaks paid fixed amount annually to the Vijayanagar empire. After the death of Krishna Deva Raya (King of Vijayanagar empire) in 1530 AD, the Nayaks became independent and ruled the territories under their control. Among Nayaks, Thirumalai Nayak (1623-1659) was very popular, even now he is popular among people, since, it was he who contributed to the creation of many magnificent structures in and around Madurai. The Raja Gopuram of the Meenakshi Amman Temple, The Pudu Mandapam and The Thirumalai Nayakar's Palace are living monuments to his artistic fervor. Madurai started slipping into the hands of the British's East India Company. In 1781, British appointed their representatives to look after Madurai. George Procter was the first collector of Madurai. Worshipping Arulmighu Meenakshi Amman at first had been the manner of prayer traditionally. Devotees should enter the temple through East Gopuram, pass along Ashtasakthi Mandapam, Meenakshi Nayakar Mandapam and Mudali Mandapam, take a bath in the Golden Lotus pond and wear clean clothes. Foremost, they must worship the Viboothi Vinayakar on the south of the sacred pond. From the southern bank, devotees could worship the golden pinnacles of Swamy and Amman temples. They can see the 64 miracles of Lord Shiva on the walls surrounding the pond. After worshipping Sithi Vinayakar, Kumaran and other deities in the parrot cage mandapam, must go round the altar at the Amman Sannidhi, and then enter the sanctum through the main entrance. Men and women should stand in separate rows and worship the deity. Devotees should meditate the five holy alphabets, recite the sacred names of the Lord, sing divine songs and go round the shrine. 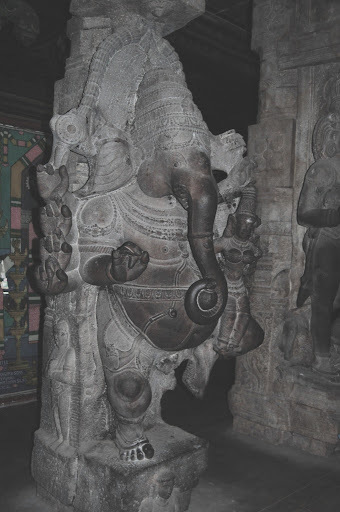 While going round the first corridor, Airavatha Vinayakar on the south east, Valla Vinayakar on the south west, Nirutha Ganapathy and Muthukumaraswamy and Chandikeswarar on the northwest must be worshipped. While going round the second corridor, the devotees could see a statue of Thirumalai Naicker in the east, kolu mandapam and Koodalkumarar sannidhi in the west.After worshipping Kumarar, the devotees should proceed to the second corridor of Swamy shrine. It is the normal practice toseek the permission of Nandiam Perumal to grant permission to enter the temple. After that the Anukgnai Vinayakar and the Nandi at the main entrance to the Swamy temple. After that the devotees should proceed along the six pillared pedestal and worship Chandrasekarar and other deities and the Natarajar who danced changing his legs at the Velliyambalam and then worship the Lord at the sanctum. While going round the first corridor of the Swamy temple, Vandhiyammai, Sivalingam, Sun, Kalaimagal, the Saints, Somaskander, various Lingams, Pitchadanar, Kasiviswanathar, Ellam Valla Siddhar, Durgai Amman, Kadamba tree, Kanagasabai Natarajar, Chandikeswarar, Atcharalingam, Mahalakshmi, Rathnasabai Natarajar, Vanniyum well, Lingam and Bhairavar should be worshipped in that order before coming out. On the north of the main entrance is the shrine of Arulmighu Palani Andavar. Having worshipped the deities including Sadayappar between the Nandhi Mandapam and coming round the hundred pillar hall, Agni Veeraputhirar, Ahora Veerapathirar, Ooothuva Thandava Moorthy and Badrakali, devotees should proceed to the Thirugnanasambandar mandapam and there offer worship to the four deities, Mangayarkarasiyar, Kulachirayar and Nedumaranayar and then after paying obeisance to the flag pole, they should sit down for a while. Later the idols of Hanumar, Krishnar and other deities on the pillars at the back and then enter the middle way and leave through Amman Sannidhi. Devotees proceeding the temple should bathe and wear Saiva symbols such as holy ash, Uthiraksham, and carry with them coconut, fruits, incense and other items of offering to the extent possible. It is the practice to meditate the holy scriptures, and recite the saced names of the deities while in the sacred premises. The Outer Gopuram, Ashta Shakti Mandapam, Chitra Gopuram, Mudali Mandapam, Potramaraikulam Rani Mangmmal Mandapam, Oonjal Mandapam, Killikoondu Mandapam, Ayirakkal Mandapam, Musical Pillars, Thattu Chuttur Mandapam and the Raja Gopuram. approximately 240 meters by 8260 meters. The Meenakshi-Sundareswarar Thirukkalyanam (wedding) is celebrated every year in the month of Chithirai (March/April). The Meenakshi temple is always filled with worshippers, but its grandest moments are in Chithirai, when a veritable human sea floods the temple on all ten days of the festival. 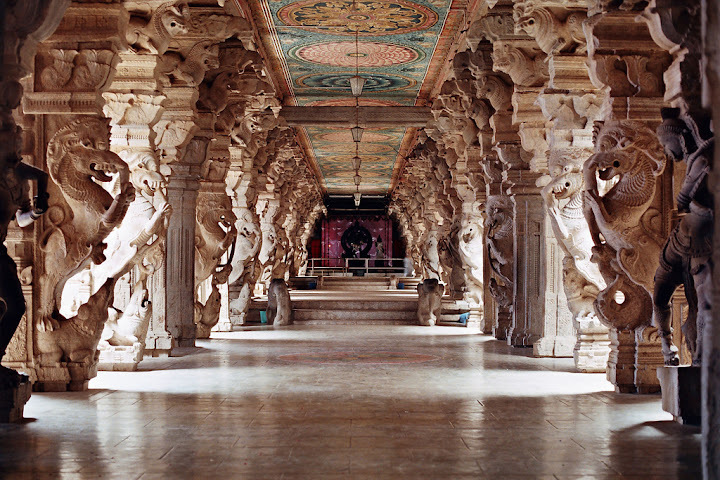 Walking westwards from the Ashta Shakti Mandapam, you enter the Meenakshi Naicker Mandapam. Each pillar in this hall has the sculpted figure of a yali - a lion-like animal with an elephant's proboscis. A small mandapam joins the Ashta Sakthi Mandapam and the Meenakshi Naicker Mandapam. There is a verandah on each side of this mandapam. 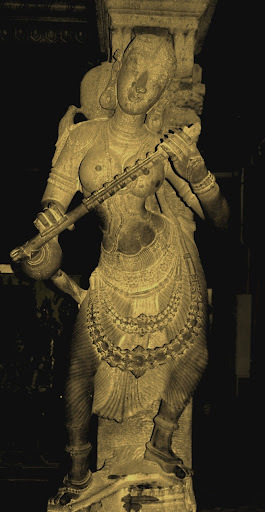 On the southern verandah there is a statue of Goddess Parvathi eight feet in height. 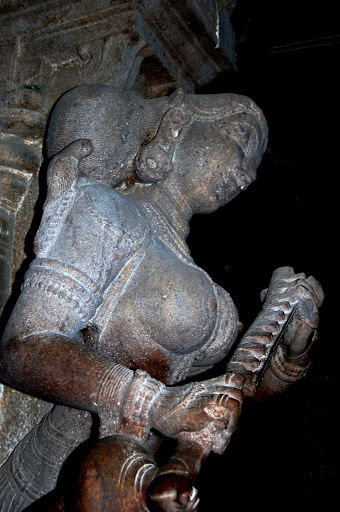 She is in a dancing pose with a 'Soolayudham' (a fierce weapon) in one of her hands. A five-hooded serpent shelters her head from the sun and rain. Some consider this statue to be that of a huntress. On the northern verandah, there is a statue of a hunter. This statue is also eight feet high. The hunter has majestic look. The legends say that Lord Sundarar and Sree Meenakshi appeared in the form of a hunter and huntress and blessed a villain who repented for his crimes. It is believed that these statues relieve the suffering of those who repent for their sins. 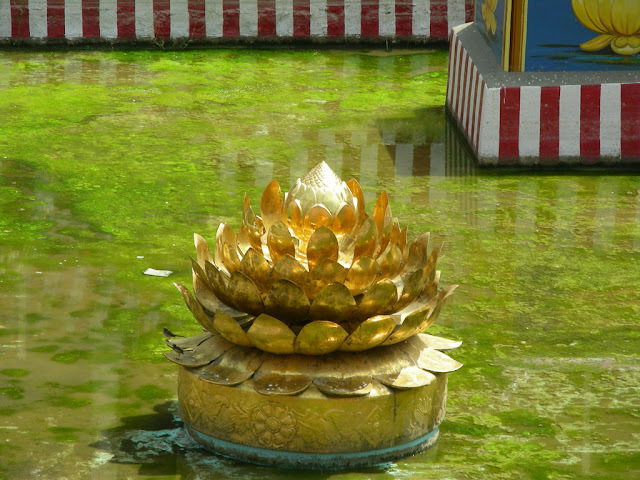 Passing through another pavilion called the Mudali Mandapam, you came to the Potramaraikulam (golden lotus tank). This tank is 165 feet long and 120 feet wide. There are stone steps on all four sides leading almost to its bottom. The tank is filled with water during most part of the year. Only very rarely does the tank get dry. Before entering the sanctum sanctorum, the devotees who go into the temple bare-footed, wash their feet in the tank's water. The southwestern comer of the Golden Lily Tank presents a grand view to one coming in the from the Mudali Mandapam. In the background, we see the upper part of the majestic southern tower of the temple. The area around this tank was the meeting place of the Tamil Sangam - the ancient academy poets. The history of the Sangam goes back to the days when gods dallied with men. This academy judged the worth of any work of literature present~ before it by throwing it into the tank. Only those that did not sink well'~ considered worthy of attention. The tank is surrounded by a pillared corridor steps lead down into the tank; enabling worshippers to bathe in it. The Oonjal (swing) Mandapam and Killikoodu (parrot cage) Mandapam are on the western side of the tank. Every Friday, the golden idols of Meenakshi and Sundareswarar are seated on the swing in the Oonjal Mandapam and hymns are sung as the deities gaily swing to and fro. The parrots in the Killikoodu Mandapam have been trained to repeat Meenakshi's name. But more interesting are the 28 pillars of the mandapam ,.which exhibit some excellent sculptures of figures from Hindu mythology. From here, you can enter Meenakshi's sanctum sanctorum through a gateway surmounted by a three-storied tower. Non-Hindus are riot allowed beyond ' ' this entrance. 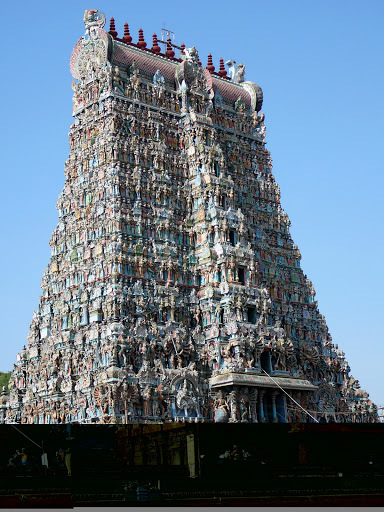 Having worshipped Meenakshi, you cross over to the Sundareswarar temple through a five-storied tower-entrance. Opposite this gateway is a huge idol of Vinayaka. The sanctum sanctorum of Sundareswarar, is closed to non-Hindus. Nevertheless, there is a lot to interest the non-Hindu visitor outside the sanctum sanctorum. The Swamy Temple On each side of the entrance to the Swamy temple (Lord Sundareswarar) is a statue of a Dwarabalaga or guard, 12 feet tall. On a nearby pillar, we see Lord Siva and his consort Sree Meenakshi, each with five heads. Other statues 8re that of Appar, Sundarar, Sambandar and Manickavasagar. Next is the three-storied tower of the Swamy sannadhi, bearing in all 36 sculptures. Non-Hindus are not allowed to go beyond this entrance. Inside : the gateway of this tower are Adhigara Nandhi and Chamundi. After the pragaram, we enter the inner pragaram of Lord Sundareswarar. We first come to a big hall called 'Veli Ambalam' where we see the dancing idol of Nataraja. The idol of Nataraja is plated with silver. It is unique, as there is no other known idol of the Lord standing on his left leg with his right leg raised to his shoulder. Generally, it is the other way around. 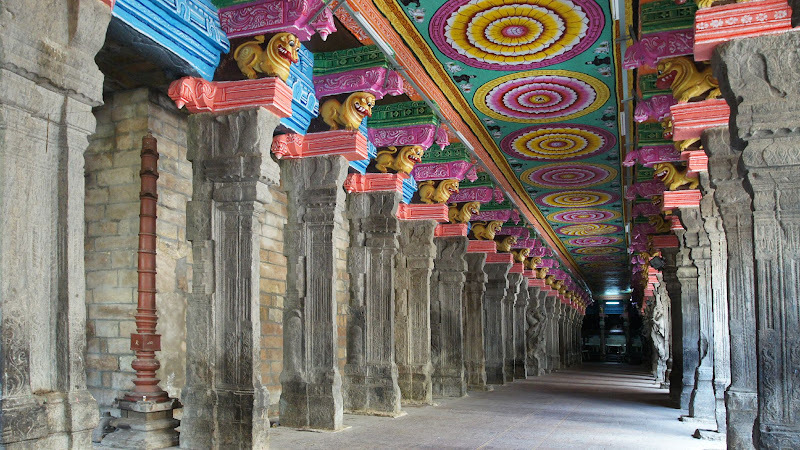 The Veera Vasantharayar Mandapam is in the Adi Veedhi, a street which runs around the Meenakshi - Sundareswarar temple. To the north of this mandapam is the fascinating Ayirankaal Mandapam (Hall of the thousand pillars). 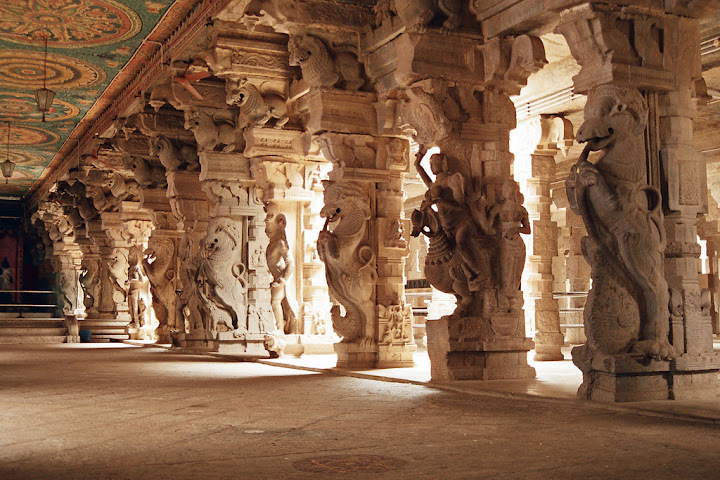 985 pillars, each profusely decorated, provide an exuberant display of Dravidian sculpture. This 16th century mandapam also houses the Temple Museum. Going south from the Thousand Pillar Mandapam, we come to an open space where we find a newly built mandapam, the Mangaiyarkarasi Mandapam. The statues of Mangayarkarasi, Kulachirayar, Koon Pandian and Gnanasambandar find a place in this mandapam. The Linga form of Lord Siva has also been installed in this mandapam. This mandapam is named after the queen who contributed well to the growth of the Tamil language and the Saivite religion. To the south of the Mangayarkarasi Mandapam is the Servaikarar Mandapam, built by the Marudhu Pandyas. On the left pillar we see the figure of Elder Marudhu. We next come to the Thirukalyana Mandapam in which the marriage ceremony of Sree Meenakshi is performed every year during the Chithirai Festival. On the southern and northern walls, the origin of the universe and the living beings is painted within big circles. Just outside this mandapam, towards the west, are the Auspicial Pillars. Each pillar, when struck, produces a different swara - musical note. Another magnificent construction within the temple is the Vasantha Mandapam built by Tirumalai Nayakkar. Vasanthotsavam - the Spring festival - is celebrated in this mandapam in Vaikasi (April/May). Its pillars contain elaborate sculptures of Siva, Meenakshi, scenes from their wedding as well as the figures of ten of the Nayak Kings and their consorts. This is also called the Pudhu Mandapam. The summer spring festival would be hosted for nine days at the Velliaymbala mandapam. Swamy and Amman would be taken in procession along Chitra streets. 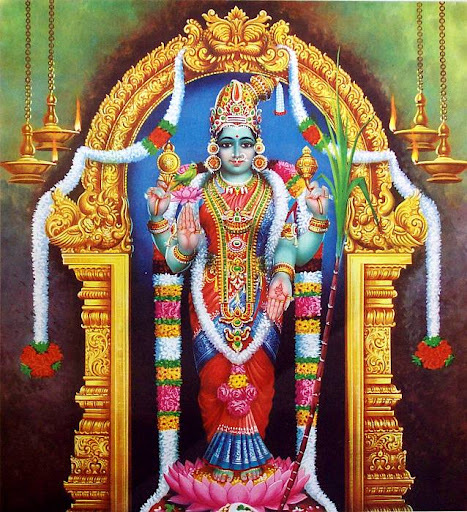 On the day of Panguni Uthiram, Swamy and Amman would proceed to Arulmighu Thiruvappudayar temple and bless those who excel in their religious belief by sprinkling `rasa vadham'. Madurai is well connected all over India through Road, rail and by Air. The railway station is one of the busiest in the country and has computerized reservation counters. Madurai division has repeatedly received the award for being the best-maintained station in the Southern Railway. The railway station code for Madurai junction is MDU. It is connected to most major Indian cities and towns. Madurai Railway Division is the second largest revenue generating division in Tamilnadu next only to Chennai. As the TN's second largest City strucks daily with a single railway terminal unable to handle the heavy Passenger Crowds, Southern Railway has come-up with a plan of extension & modification of the City Junction. Works are going on in the same at fast pace. Madurai has several major bus stands: Madurai Integrated Bus Terminus (MIBT) at Maattuthavani (North), Palanganatham (South), Arappalayam (West), Periyar (Central) and Anna Bus stand (East). From MIBT, many buses to locations all over the south India operate round the clock. From Arapalayam bus stand, buses to places of western Tamil Nadu like Theni, Coimbatore, Tirupur, Erode, Salem operate and Periyar bus stand is where only city buses and private buses to major cities operate. Anna bus stand and Palanganatham are not in operation currently. Apart fom city buses, three-wheeled, black and yellow auto-rickshaws, referred to as autos, are available for travel with in the city. MIBT has pre-paid auto counter where commuters can pay fixed auto-fare depends on destination and hire. Bridges have been constructed across the Vaigai river to connect Madurai at various points. Flyovers have been constructed within the city to overcome traffic congestion. Four lane express highways to Chennai, Kanyakumari, Tuticorin and Bangalore make Madurai well-connected by road. Madurai Airport is 12 kilometers from Madurai Junction and it offers flights to major cities in southern and western India. Madurai airport has handled 3 lakhs passengers between the period Jan 2009 to Oct 2009  Paramount Airways, Jet Air Ways, Kingfisher Airlines, Air India operates flights from and to Madurai. Flight services to Chennai, Bangalore, Mumbai are available at Madurai Airport. Madurai Airport is under a major expansion now with a state-of- the-art new integrated terminal of 17,560 Sq.ms space being built. The terminal is all set to come for operation by Second Quarter of 2010. International connectivity is expected after the modernization gets over. It has an average elevation of 101 meters above mean sea level. The climate is dry and hot, with Northeast monsoon rains during October-December. Temperatures during summer reach a maximum of 40 and a minimum of 26.3 �C, though temperatures over 43 �C are not uncommon. Winter temperatures range between 29.6 and 18 �C. The average annual rainfall is about 85 cm. 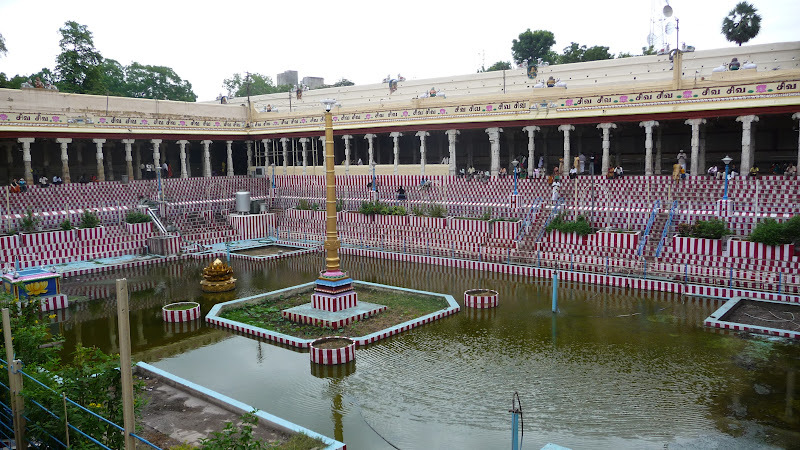 This palace complex was constructed in the Indo-Saracen style by Thirumalai Nayakar in 1636. It is a national monument and is now under the care of the Tamil Nadu Archaeological Department. The original palace complex was four times bigger than the present structure. It was divided into two parts, Swarga-vilasa and Ranga-vilasa. In each of these there are royal residences, theater, shrines, apartments, armory, palanquin place, royal bandstand, quarters, pond and garden. 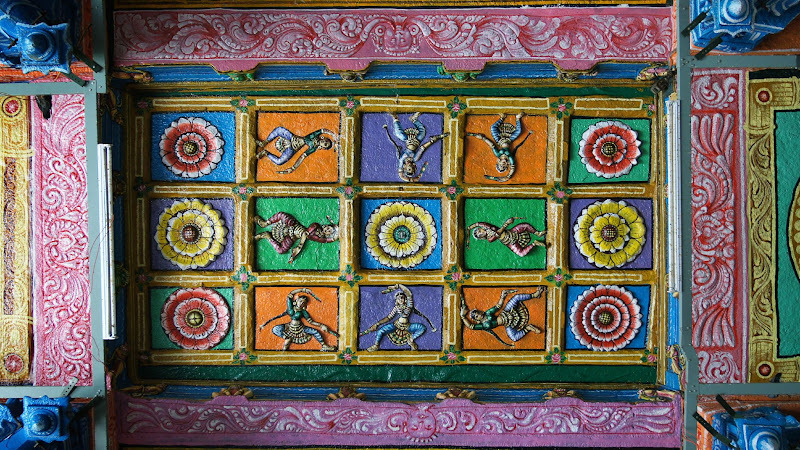 The ceilings are decorated with large paintings showing Shaivite and Vaishnavite themes. The portico known as Swarga Vilasam is an arcaded octagon wholly constructed of bricks and mortar without the support of a single rafter or girder. The stucco work on its domes and arches is remarkable. The gigantic pillars and structures represent architectural mastery. The courtyard and the dancing hall are central attractions for visitors. There are 248 pillars, each 58 feet tall and 5 feet in diameter. Furniture and utensils used by the kings is on exhibit inside the palace. The palace is equipped to perform "Light and Sound" shows depicting the story of "Silappathikaram", in both Tamil and English languages. Rani Mangamma's palace has been renewed and converted to Gandhi museum.The museum displays information about Mahatma Gandhi, and most importantly it showcases the blood-stained garment of Gandhi when he was assassinated. The other piece of the garment is kept at the Gandhi Museum in Delhi. This museum, is one of the 5 museums in India (others in Mumbai, Barrackpore, Sabarmati and Patna) known as Gandhi Sanghralayas. Also lot of pictures taken during the Life time of Gandhi with various leaders all around the world and also during various incidents of freedom struggle is kept. Martin Luther King Jr. visited the museum during his tour of India in 1959 and is said to have got his inspiration to launch a series of peaceful agitations against racial discrimination No entry fee for museum visitors. Theppakulam belongs to Vandiyur Mariyamman temple. It has become quite a pilgrim spot now. There is an artificial island at the centre, made of stone. It is was built sometime around 1500 A.D.
A beautiful Vishnu temple which has Navagraham also (usually Navagraham is found only in Shiva temple). There is a hayagrivar temple close to this temple where hayagrivar (Horse/"haya"griva avataram) is the main deity. Most of the students do their regular prayer here as hayagrivar is the one who brought the epic fallen into water back to the earth. This is one of the temple found in center of city. This is located 100 mtrs north to the Kazimar Big Mosque (Periya pallivasal) and to the south of Sunnambukara street. This temple is believed to be older than the Meenakshi temple. What beautiful pictures! Thanks for posting. 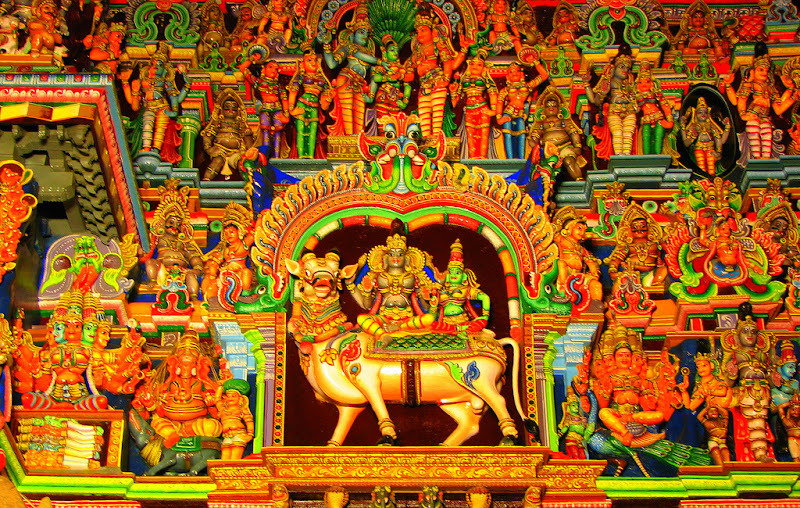 Goddess Meenakshi and LOrd Sundareswara are the Presiding Deities at the Madurai Temple. Goddess Meenakshi is considered as Raja Mathangi Devi and Raja Shyamala. She is the Minister or Manthrini to the Divine Mother, Lalithambigai! Thanks for the links Charitra.